The Chakras are an ideal roadmap for personal growth and development. In 2017 we started our journey through the Chakras and focused on one energy center a month. We are going to keep on going in 2018! On our monthly adventure, I am going to educate you about a specific Chakra or a Chakra concept and then ask you to contemplate its function and roll in your own personal growth. This month, November, we are going to focus on gratitude and cultivating the higher vibrating emotions of the Heart Chakra. Since Thanksgiving is this month, this is traditionally a time to think about what is good in your life and what you are thankful for. The Chakras are openings for life energy to flow into and out of our aura or electromagnetic field. There are main Chakras, minor, subpersonal, and transpersonal Chakras. The Chakras’ function is to vitalize the physical body and to bring about the development of our self-consciousness. Each Chakra is associated with certain physical, mental, emotional, and spiritual interactions. Each Chakra has personal growth themes, functions, and purposes. The concept of the Chakras has been around for thousands of years; but the energy coming to us from the cosmos is changing. We are receiving potent and new energies of high frequency light from the universe. The main Chakras (Root to Crown) were appropriate for us these past 2000 years. As we move into a new era, chakras above, inside, and below the physical body are forming and others are waking up from dormancy to help us evolve into our new future. Our journey through the Chakras will focus on ALL of these Chakras; main, minor, subpersonal, and transpersonal. Negativity and lower vibrating emotions often are primal emotions that exist in the lower three chakras; the Root, Sacral, and Solar Plexus. Low vibrating emotions include anger, fear, panic, anxiety, powerlessness, depression, shame, guilt, greed, boredom, pessimism, frustration, disappointment, doubt, rage, jealousy, and grief. They make us feel bad and are uncomfortable. The lower chakras are more about survival, power, and the material world whereas the upper chakras are more about unity, self-actualization, and transcendence. The functions of the Heart Chakra include the high vibrating emotions and feelings of love, self-love, compassion, empathy, peace, respect, non-judgment, acceptance, forgiveness, hope, contentment, optimism, joy, appreciation, passion, enthusiasm, awe, serenity, and gratitude. These emotions make us feel expansive and build resilience. 1. One way to shift low vibrating emotions is to think of the lower vibrating emotion you want to release/heal. 2. Then identify the opposite of that emotion- The Heart Chakra Emotion. For example, if anxiety is a low vibrating emotion you want to release, then perhaps calmness is the opposite emotion of anxiety to you. November 2018 Chakra Contemplation and Suggestions: Gratitude is a very high vibrating Heart Chakra emotion. Gratitude is the quality of being thankful. This Thanksgiving, spend some time reflecting on what you are truly thankful for. Even when times seem tough and life is stressful, there is always a silver lining. We all have something to be grateful for…. Since the Chakras guide every area of our lives, I like to structure my gratitude exercise around the chakras. Connect with your heart and ask, “What am I grateful in each one of my chakras?” You can utilize the prompts that I created below. Journal what you are grateful for; take pictures of what you are grateful for; find objects or tokens that reflect or symbolize what you are grateful for. 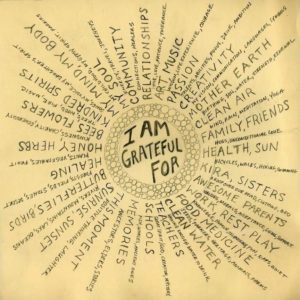 Reflect on your gratitude for all that is good in your life on a regular basis, especially when you are struggling with some of the lower vibrating emotions of the lower chakras. Want to learn more about the chakras? About: Christina Wilke-Burbach PhD, RMT, CA is a Spiritual Counselor, Holistic Health Consultant, Certified Aromatherapist, Herbalist, Master Gardener, Docent, and Reiki Master Teacher with a PhD in Health Psychology. Her business, Mind, Soul, and Self LLC is based out of Wisconsin. She has 20 years of experience in psychology, spirituality, and natural health. For more info on Dr. Christina and her upcoming Chakra Retreats, Chakra Classes, Chakra Bootcamps, or to schedule an individual reading or appointment, please visit mindsoulandself.com. Many Blessings and Be Well!